Titanfall: the Modern Warfare of the new generation? Into every generation, a chosen one is born. It alone must stand against the PS4s, the Wii Us, and the PC Steam Sales. It is the killer app. And you've got to hand it to Microsoft – it's throwing absolutely everything it's got behind Titanfall, Xbox's killer app of this generation and the multiplayer-only FPS predicted to be a genuine contender to Call of Duty's crown. The company has tweaked the Xbox One's controller sensitivity in a recent patch specifically because Titanfall's developer Respawn requested it. At the same time, Respawn was working with Microsoft on a new version of the console's upscaler, which will vastly improve the conversion of sub-1080p resolutions up to that coveted 1080p. The console's next big UI update, which will make much-demanded improvements to friends lists, multiplayer apps and social features, has been timed to hit just before Titanfall launches. The Xbox One Twitch app (soon to be the most "complete" Twitch app you'll find on any console) will finally allow for broadcasting on 11th March – you guessed it, just in time for Titanfall. At this point, if a Respawn intern told Microsoft they needed hourly pizzas and a steady stream of backrubs in order to make this game as good as it can possibly be, I have a feeling the publisher wouldn't think twice about indulging them. Halo, is it me you're looking fooooor? 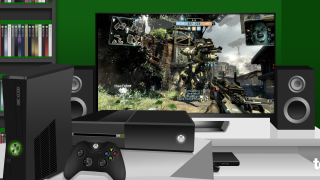 Is TItanfall Xbox One's killer app? Look, Rob covered the numbers in Tuesday's PlayStation Gamer, so I won't bore you with them again here, but it would be foolish to deny that PS4's sales figures are creeping ahead of the Xbox One's. Though Microsoft has insisted it's happy with the number of consoles shifted so far, it's a fact that Sony is slowly pulling ahead with its rival product, thanks primarily to a lower price point and a near-flawless marketing strategy since E3 last year. But that said, rumours of vast quantities of Xbox One stock gathering dust on retail shelves have been greatly exaggerated, as the internet is wont to do. Rob was right; console launches don't tend to sit anywhere between huge successes and resounding failures – but I think both consoles are already safely out of the latter camp. The Xbox One is well on track to beating records set by its predecessor, the Xbox 360, during its golden years. Bear in mind, too, that whilst the PS4 is now available in most of its key territories after its launch in its native Japan this week, there are a great many countries where the Xbox One has yet to go on sale. "It's a very smart one that'll almost certainly ensure greater parity between the number of Xbox Ones and PS4s sold." Say what you will about Microsoft, but it's been lightning-quick to respond to feedback over the last year or so, as evidenced during the Great U-Turn of 2013. And it knows Titanfall is a potential system-seller, just like Halo was for the original Xbox and Call of Duty 2 for the Xbox 360's launch. People will buy a console to play this one game, so Microsoft is doing everything in its power to make the decision to part with hard-earned cash as much of a no-brainer for those consumers as possible. Sure, some early adopters of the Xbox One are feeling a little miffed right now, but that's the literal price you pay for making the choice and buying into something early. Bottom line is, a more competitive marketplace is better for everyone in the long run. Microsoft's cards are well and truly on the table now – the only thing that's left to do is see how Titanfall performs. But between you and I, I'm more interested in seeing what both companies have in store beyond Titanfall's March launch. Whatever happens next, one thing is clear – with so many lines being drawn in the sand, this E3 is going to be an interesting one.